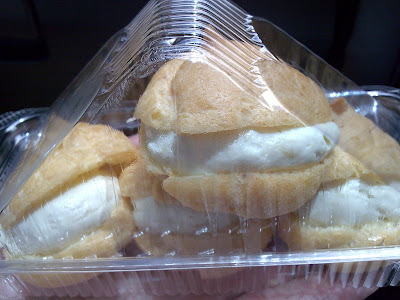 After hearing so much bout this outlet which sells yummy durian cream puffs, I decided to go buy some and try. 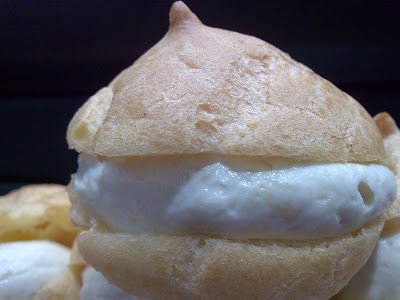 No doubt non-durian lovers will be put off by such pungent smelling innocent looking tiny puffs. But the durian beast in me was unleashed, hehe, as hey! I managed to find this place! RM2.40 will get you 4 pieces of the precious puffs, a STEAL!! The Chinese guy who sold me the puffs (suspect he is the owner) said that if I am to jalan-jalan around, basking in the hot sun, the puffs won’t last after an hour! Uh-oh. I bought 2 packets cz thought wanna let my durian fanatic dad try in Ipoh. Hmm, if put in fridge can tahan few days. Oh, ok gotcha! Then the puffs got ultimate VIP 5 Star treatment, sat on my lap in the car, and when we shopped at Pavilion, they (1 box left, as i ate 1 in the car … haha) stayed inside my bag, just so they can get FREE air-cond. Saved one packet to be brought home, but once again, they received the same fate as the Tong Kee egg tarts, squished and all 4 pcs stuck together. Haha .. But nothing can stop dear dad from attacking anything that resembles or smells of durian! Finger-licking goodness, he claimed. Hi,I am wondering that how could I get to this kafe if starting point from Pasar Seni LRT Station? exit the station and walk east-bound towards Jalan Tun HS Lee. 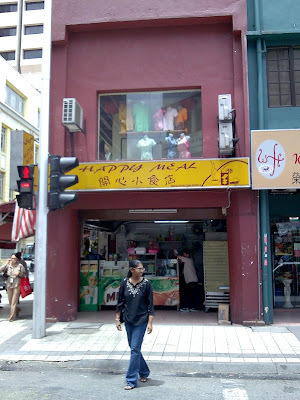 Then go towards Petaling Street direction and you will find this cafe at a junction after you pass Petaling Street on your right.